In AP Language we decided to do an assignment right off the bat that would not only help us get to know our students and what is important to them, but also help them dive right in to rhetoric and authentic writing. This year students will be participating in the NY Times Student Editorial Writing Contest. For this project, students will write an editorial on a topic of their choosing, 450 words, with at least 2 pieces of research. We reviewed the assignment with students, they read the NYT winners from last year, and compiled a list of skills they noticed made the editorials successful. We then brainstormed topics we were interested in with the people at our table. 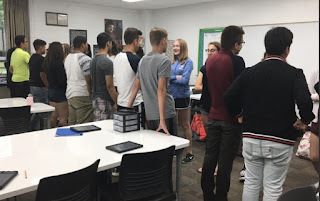 To start narrowing down our topic, we got students up on their feet, doing a "speed dating" activity that I have seen our foreign language teachers do, specifically Linda Ashida. One side of the room talked about the topic they were interested in; the other side of the room asked questions to help narrow their focus and ultimately reach a call to action. After every 30 seconds, students would switch and continue to speak about their topic. They ended the activity by returning to their seats and debriefing with their table. From their students wrote their first draft of their editorial. Over the next few days they shared with their peers, receiving preliminary feedback on audience and purpose. This week students will revise their appeal to strengthen their appeal to ethos, next week pathos, the final week logos--ultimately they will write one final draft in which they find the appropriate balance for their specific call to action. Our goal is for students to write several drafts over the coming months, incorporating what they are learning in AP Lang, but also using what they are leaning from the writing process and applying it to their classroom reading and writing as well. Please follow us at the hashtag #1YrInEng to see how we are doing!